Barry creates beautiful, functional, and innovative metalwork. His skill in engineering and design are shown in these photos of the spiral stairs, railings, coat hooks, toilet paper holder, barn hinges, and garage door handle. He truly is an artisan. 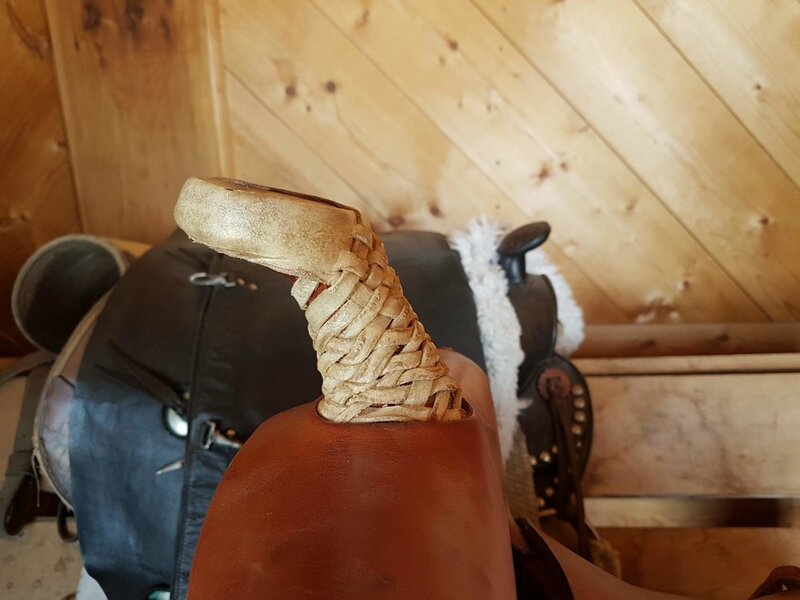 Leather tool, braiding, sewing, structural repairs on saddletrees, and more. Barry is a builder. It comes easily to him and he loves it. This house is the first of many things Barry built for us. Barry’s built our Farmhouse for us. Barry built almost all the wood furniture and cabinets in our home. The Garrett is in the loft of our Big Red Barn. Barry designed the ground floor of our barn to be an emergency shelter for our farm animals, and the upper floor to be a workshop for his artisan projects, including his saddle repairs and leather tooling. Barry built our Big Red Barn, with the Garrett in its loft, to house house his leather craft. Four more buildings: three cabins and our art studio. These buildings all have a story to tell. GRANNIE’S GROTTO: originally was going to be a dog kennel before we decided we would much rather have a cabin. This was our first cabin. THE CROFT; we originally built this to be a greenhouse for tomatoes but it didn’t have enough light for the tomatoes to produce fruit. It stood empty for a long time before we had the idea of making into a cabin. This was our third cabin. THE FISH HUT: This little cabin was built to be a cabin, but the appliances we put in it were salvaged out of a truck camper that had rolled over. THE STUDIO; our Studio was originally built to be a temporary dwelling for one of our sons. After he left it saw a few more guests before we decided to turn it into an Art Studio. Toys, recreation, and sets for a Live Nativity, are other areas Barry has turned his abilities. Barry is happy to work with you to meet your framing needs, whether you are wanting a rustic barnwood frame, or something more sophisticated, with multiple matting. Barry is also doing all the framing and hanging for my artwork.